Where to find Spruce View hotels near an airport? 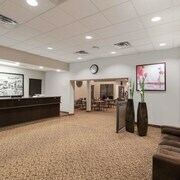 Where can I find hotels in Spruce View that are near tourist attractions? Unfortunately, our extensive Canada accommodation database doesn't list any places to stay in the vicinity of greater Spruce View. Edmonton is 170 kilometres (108 miles) from Spruce View. It offers a number of Expedia-listed apartments and hotels including the The Fairmont Hotel Macdonald and Fantasyland Hotel. Like to travel a little further afield? Central Alberta offers a number of things to see. 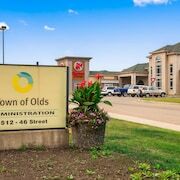 Check out Central Alberta's old towns and archeological sites. Those who love fresh air and wide open spaces can also take the time to enjoy its forests. In this part of Canada visitors may try their hand at snowboarding, skiing and cross-country skiing. Sylvan Lake is 30 kilometres (20 miles) to the northeast of Spruce View and is home to the Lakewood Golf Club and Top O' The Hill Golf Course. 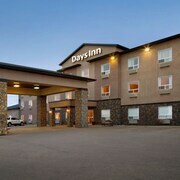 The Comfort Inn And Suites Sylvan Lake and Best Western Plus Chateau Inn Sylvan Lake are some of the lodging options in Sylvan Lake. 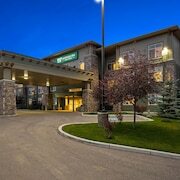 Alternatively, you could stay in Innisfail, 30 kilometres (19 miles) to the east of Spruce View, where you can choose from the Best Western Innisfail Inn and Super 8 Innisfail. The Innisfail Golf Club and Discovery Wildlife Park are a couple of the more popular sites to see for those visiting Innisfail. Before you head home from Central Alberta, make sure you catch some sport. Visit Plainsmen Arena to the south of Spruce View. Those sports fans wishing to find a bed close to the action can take their choice from the Holiday Inn Express Hotel & Suites Airdrie-Calgary North or the Comfort Inn & Suites. Calgary International Airport is a practical airport, and is 110 kilometres (68 miles) from Spruce View. 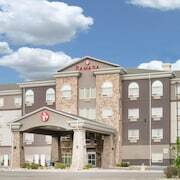 Nearby hotels include Delta Hotels by Marriott Calgary Airport In-Terminal and Best Western Premier Freeport Inn & Suites. 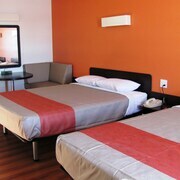 What are the most popular Spruce View hotels? Are there hotels in other cities near Spruce View? What other types of accommodations are available in Spruce View? Explore Spruce View with Expedia.ca’s Travel Guides to find the best flights, cars, holiday packages and more!